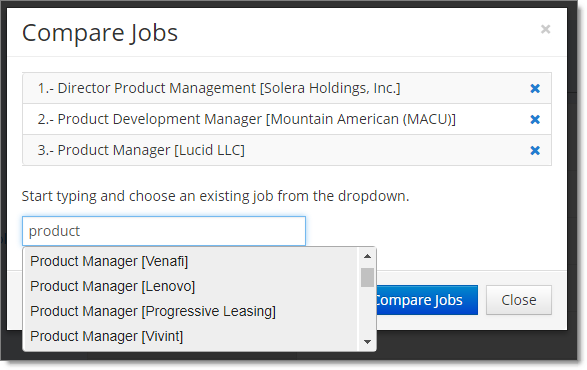 From there, I can easily add or remove critieria that I want to see on my comparison page. For me, the most important things to compare include salary (as ONE component of compensation), strength of health benefits, 401k match, opportunity for growth, strength of company in the industry, opportunity the company has to grow, the team I’d work with, etc. To see those fields you have to put them in at least one Job record as custom fields. We’re working on making it easier to do that from this interface (then we’ll be in Version 1.0!). 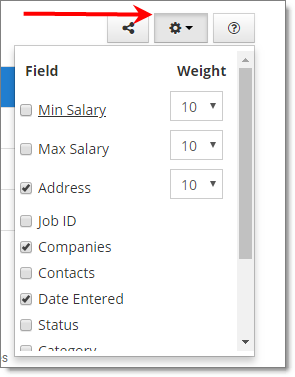 For now, you can simply check or uncheck the fields you want to show along the left (and, go into a Job and add any other custom fields, which will then show up in this dropdown). In the screen above you can also see the three boxes with “10” in them… this allows you to weigh critieria differently. For example, if the commute time is more really important to you you will weigh that heavier than something else. The reason we built this is because choosing jobs just based on salary is flawed. Salary is one part of the picture, but it should not be the only thing you consider. Have ideas or requests? Shoot them to me at Jason@JibberJobber.com. We’re working on making this better right now, and are anxious to hear what you think! Twelve years ago, almost to this day, JibberJobber went live. It was the best of times and the worst of times. The best because I was living my entrepreneurial dream, and ready to change the world. I was super optimistic. It was the worst of times because just five months earlier I was laid off and went through a horrible job search and experienced real, long-term depression. Mine was truly an entrepreneurial journey. There was optimism and there were some very difficult periods. I made a lot of decisions that were great, and a lot that were not great. My pricing decisions have fallen into both of these categories at one point or another. I got a lot of advice, much of which was bad, and changed the pricing model a few times. Today I am announcing a new change that is probably long overdue. It’s a hard thing to announce because it’s the first time we are going this direction. However, it is a critical decision I’ve had to make for the viability and future of JibberJobber. Starting this week, the Free Level allows you to have 25 Contacts and 25 Companies (instead of 500 Contacts and 500 Companies). You still get access to all features except Email2Log, bulk importing, and push notifications on Reminders (Action Items). What is the Premium Level? The Premium Level price remains at $60 a year. You have unlimited access to all features, and you can add as many Contacts an Companies as you want, and you get full access to the JibberJobber Video Library. All new signups will have a seven day trial period, where they get the Premium Level. After seven days they go down to the Free Level (25 Contacts/Companies and no Email2Log, etc.) until they upgrade. Anyone who has signed up before this change will get 90 days of Premium to decide what to do before their account goes to the Free Level. I have been personally funding JibberJobber for twelve years. The free accounts, the people who have used JibberJobber but never upgraded, the free upgrades for veterans, has mostly been funded out of my own pocket. My two “investors,” my dad and my father-in-law, helped get JibberJobber up and running. If I were to hire an experienced CEO today, he or she would probably make this decision immediately and without hesitation. He or she wouldn’t have the emotional ties to users, past and present, that I do. It would be a much easier decision because it is the right decision. For me, the emotion makes it’s a hard decision, but I know it is the right thing to do. I understand that some users will be unhappy but for the good of the system, for improvements and upgrades and maintenance, to have a future with career management, we need to do this. I appreciate your support. If you don’t support this and you go somewhere else, I respect that. Here’s to another solid twelve years of helping people stay organized and land their dream job. If you choose to upgrade, please know that we are not squandering your money. It’s only $60 but we take that very serious, and are invested in making this better, faster, and more relevant for you. We have been working on something that we hope you love. 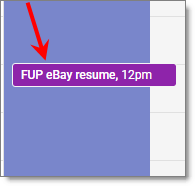 You can now push your Action Items (aka Reminders) to Google Calendar. 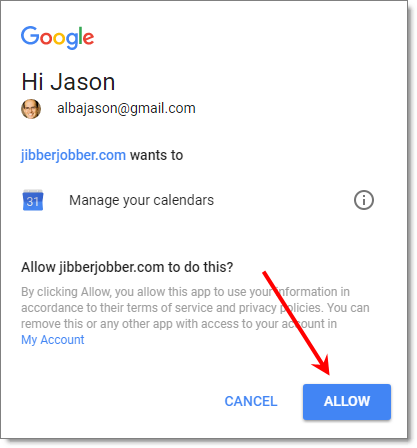 This is not a two-way sync because we don’t want all of your Google stuff on your JJ Reminders panel, and we don’t want all of the Log Entries on your Google Calendar… so we’re starting with just putting things you need to do in your job search pushing from JibberJobber to Google Calendar. Based on the feedback we get we might expand this, and if this works well we’ll work on other calendars (outlook.com is next, I think). On the left side of your Google Calendar (not in JibberJobber), you’ll see a list of your calendars. There is a plus icon (see the red number 1, below)… click that to add a new calendar to your calendars (see the red number 2, below). 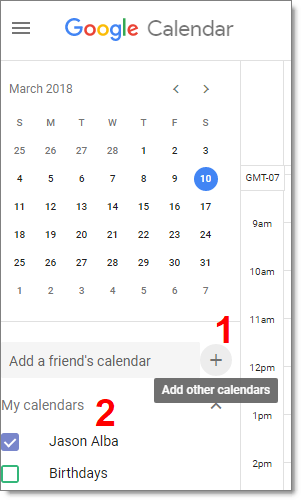 After you click the plus icon, click New calendar from the dropdown. On the New calendar page, add your new calendar. You can see how I did it below. Now, your new calendar will show up with your other calendars That was easy! 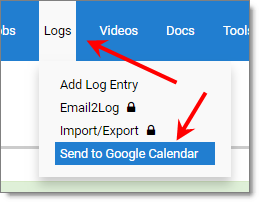 In JibberJobber, mouse over Logs and choose Send to Google Calendar (this will be put in other places later, once we are out of beta). On the next page click the button to Connect to Google Calendar. Then, Google wants to know what account you want to send to… I have more than one, but I work out of my @gmail calendar. Then, they want to know which calendar to send it to. You can see I have various calendars to choose from… choose the one you just created, then click Submit. Now you are sending Reminders!! NEXT, CREATE A REMINDER IN JIBBERJOBBER TO SEE IF IT WORKED! 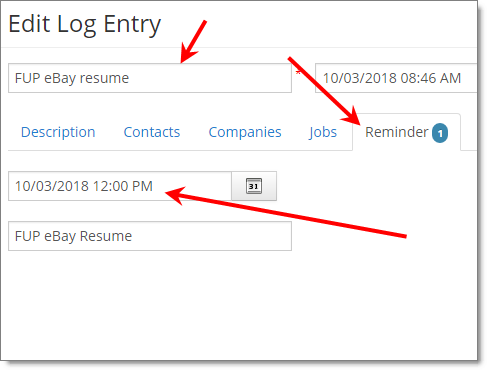 Create a Log Entry, and then click on the Reminders tab and put a Reminders date (put something for today, in a few hours). That’s it… every time you do this we queue it up and send it to the Calendar. 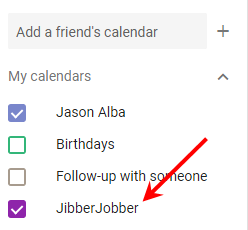 Go to your Google calendar, make sure your JibberJobber Calendar is showing, and see if it showed up. Mine looks like this (note each Calendar is color coded… my JibberJobber calendar happens to be purple). That’s it! After you take a few minutes to set this up you don’t have to think about it anymore. You can hide the new JibberJobber calendar from your view, if you want, or you can go into JibberJobber and disable this feature and stop sending stuff. Note that if you close something in either place it does not close it in the other place… so it’s not doing task management (yet). Let’s see how this goes, and the feedback we get, and we’ll decide where to go from here. This is one of the weirdest blog posts I’ve every written. In a nutshell, I got a job. A real, go to work, at an office, in a company, job. It’s been twelve years and almost a month since I was laid off. Here I am, twelve+ years later and I can’t believe I just wrote that sentence. What does this mean for JobberJobber? Nothing, and everything. Nothing because nothing big will change.. We’ll keep moving forward, and the team has plenty of work to do. Everything because of the way I’m restructuring things, I’ll be more focused on strengthening the core of JibberJobber, and doing the right things for the product and our users. More on that below. Is there such thing as a coincidence? The intense emotional roller-coaster I’ve been on these last few weeks was something I was not prepared for. I know a lot about the job search process but had forgotten just how intensely stressful parts of it can be (for me, the parts where I have no control). For the last twelve years my “real job” has been entrepreneur, founder, owner, and more. I’ve authored three (published) books, became a professional speaker, authored 30 Pluralsight courses, done webinars and podcasts and written ebooks and white papers and blog posts (for others). I built my JibberJobber team bringing in talented contractors from around the world, five of which work as a team on the product right now. I was looking for a product management job, and happened to see an opening from a company I was really, really interested in (BambooHR). The job wasn’t on the product team, but the description was close enough that it piqued my interest. 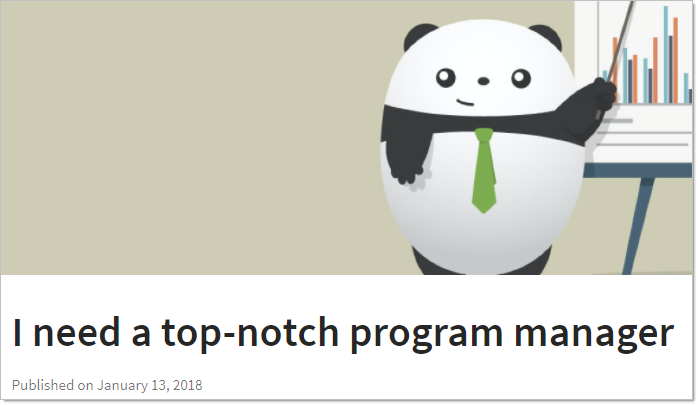 As I read it I thought “I’ve done all of these things… I could totally do this.” I applied on a whim, thinking I was really more suited for a product management job. I got a reply from the hiring manager and was brought in for my first interview… and the rest is history. But more importantly, in my research and then interview process, I fell in love with the company. BambooHR makes HR software (including ATS software – that strikes me as funny) for small to medium companies. It’s not the software I fell in love with (I hadn’t had much exposure to it), rather I fell in love with the history of BambooHR and the culture they have created. As I learned more I couldn’t help but want to be a part of this culture. I want to contribute to this culture, as I build out the vision of the thought leadership programs under my new boss, Rusty (see link above). I found Rusty’s Ted talk, and a short talk he did for Toastmasters, and read about his background. He is the type of person I want to work with. I am excited for the opportunity to learn from him and build these programs with him. I trust him, and believe in his vision, and want to be a part of this! I know the alternative… working for someone you don’t like or don’t trust, and I have no interest in that. I feel lucky to have found this opportunity at this company for this leader… a great combination! JibberJobber was born almost twelve years ago. We have had over 100,000 people sign up and try to manage and organize a job search. We currently have five people (aside from me) with dedicated roles, including customer support, QA, server admin, and software development. I have been the product manager, and with this big change I started to transition many of my functions to Liz, who many users have already interacted with. I plan on spending time, regularly, with JibberJobber, as the Chief of Product. Liz will add product manager to her duties, and will work closely with me to ensure the team focuses on the right things for our users and our future. While my team will continue to stay busy, we’ll make sure the limited amount of time we have is spent on the most important projects. When I spent four years developing Pluralsight videos I spent a lot more time there than as product manager in JibberJobber. After Pluralsight I went back to JibberJobber with a renewed interest and was appalled at where we were at. I take all of that on me, as product manager. This time I will not make the same mistakes. I’ve spent a considerable amount of time with Liz talking about vision and priorities, and have met with each of my team, and I’m dedicated to making this a great time for JibberJobber, not a time of strategic neglect. I hope this is reflected in the product, and your experience. I’ve written a few more pages but really, this is too long already. If you have any questions, let me know. I’ll be available mornings and evenings, and hope to continue our relationship. I thought that, and I’m pretty sure I said this to my wife, after I finished I’m on LinkedIn – Now What??? Writing a book is a big, time-consuming process. It taxes you mentally and is challenging. Making the time, week after week, to keep writing is hard. Second-guessing your ideas is common (but good). When I wrote my LinkedIn book I honestly had no idea what the benefits would be (they were great, both financial and as it relates to my career and marketing of JibberJobber). I coauthored my second book on Facebook, which was a different kind of hard. Then my third book (51 Alternatives to a Real Job) was self-published… and I needed to write it but haven’t marketed it. It was THE book that most people asked about at the end of my presentations, though. Everyone was interested in alternatives to a traditional job. “My next book?! I was a retired author,” I thought. This fourth book is different from the rest. It is a collection of ideas, thoughts, observations, and suggestions that I’ve accumulated over the last twelve years. It includes brilliant ideas I’ve had (I figure I have a brilliant idea every 18 months), tactics and tips for job seekers I’ve come across, and strategy and thoughts for professionals interested in career management (that is, taking a bigger role in managing their own careers). As I’ve been working on this book it’s one that I have thought my future generations might read and think “huh… great-great-great-grandpa was kind of cool.” Or at least “really interesting.” Unlike my first three books (which are too technical and will be irrelevant in a hundred years, the third is money making ideas that are good now but probably won’t be in a hundred years) this book is more principal-based… and principals can last for centuries. This book would be, as they say, evergreen. It’s a brand and marketing play. This book keeps me relevant as an expert in this space. It gives me something to talk about (self-promotion) and it gives others a reason to talk about me (and JibberJobber). I’ve learned that if I stop making things, people stop having reasons to think and talk about me. A key principal in marketing is to create new things and stay relevant. How can YOU, as a job seeker, apply this principal to your marketing strategy? It’s to monetize: No secret here, I hope to sell a lot of these. I’ll market this book mostly through JibberJobber, to people who sign up for the system. This is a perfect book for them. I hope that somehow it gets bigger than just my immediate audience though. I think it’s a super relevant book for the whole world. I could write pages and pages on this topic, but the idea is to create another passive revenue stream (passive because once I write the book and get the right systems in place for marketing and delivering it, I don’t plan on spending hardly any time on it, but I do expect it to create a revenue stream worth hundreds of dollars per month for a long time). It’s to help me rethink and challenge my expertise: I sit at my home office and interact with a handful of people every day. I am not on stage nearly as much as I was a few years ago. I’ve found that when I was on stage I got challenged regularly… either by myself or by others. I had ideas and I put them out there to audiences that would help me refine my thoughts. But sitting alone in an office doesn’t force you to challenge and refine your thoughts. Writing a book does, though. 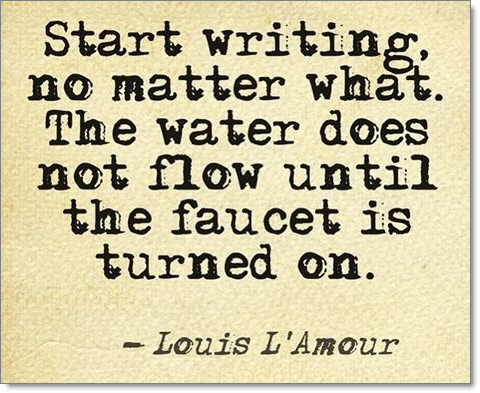 As you write you think and rethink and second-guess. This is an excellent way to really figure out where you are at and what you think and what you champion. I learned it’s even better (for this purpose) than writing a blog. You see, I can edit a blog post any time… but once your book is printed, the idea is out there. It’s way more permanent, and so you are more careful as you write down what will be definitive statements and positions. It’s the right thing to do. The ideas in this book have been building over the twelve years I’ve been doing JibberJobber. And, for a few years before that, as I immersed myself into corporate America. The thoughts have been nagging at me. I just feel like it’s what I’m supposed to do. Apparently writing is what I do, and authoring books is what I do (it’s taken years to be at peace with this). As you think about my journey, and my decision, I hope you will implement some of this in your own journey. Whether you do “that thing” (might not be writing a book) because it’s nagging at you, or it will refine you, or it will be a new revenue stream for you, one thing I know is that you have to START, and consistently follow through. I want you to be a FINISHER, and finish your projects. You should see new icons like these almost everywhere. If you find an old icon let us know… we’re making a list of places we missed. Comments Off on New Icons for JibberJobber! This is a powerful report to help you see what you have done (and give you reminders for what you need to do). This is a powerful report! 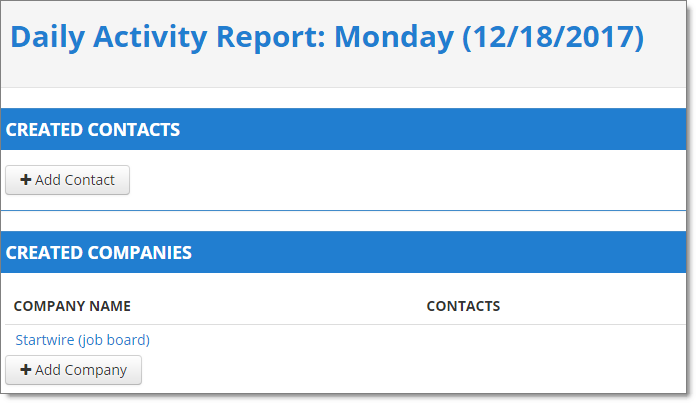 You can find it under Reports, then Daily Activity Report. In our continuing quest to improve JibberJobber we decided to tackle something that might not seem like a big deal, but it was having a negative impact on our first impression and our brand. I think we lost potential users because of this. Let you think this isn’t a big deal, and we shouldn’t spend time on it, think about the idea of losing an interview opportunity just because your resume has a typeo… how stupid is that? Stupid, yes, but it’s real. Someone sees a mistake on your resume and they think: sloppy, no attention to detail, if they don’t care about their resume, what will they care about?? The icons and colors are more in-line with the rest of the site… at least they aren’t distracting or confusing. What’s more, we changed the “tooltips,” which is the little bit of text you can read when you mouse over the icons. For example, the “x” on the far right of every widget used to say “delete.” Well, that was kind of true, it would, um… well… no, that wasn’t true. You wouldn’t delete anything. So we changed the tooltip to “Hide this widget from the homepage”. That is way, way more text, which seems to be a no-no online. But, it is accurate and descriptive. Every icon and tooltip got a makeover… all in the effort to help YOU understand what each one does. Minor stuff, but just like one typo on a resume, this should help us keep users happy. There’s more, big and small, to come! You’ve been able to do this in Facebook… it only makes sense to add this functionality to JibberJobber! When you are add a Log Entry (manually) you can now make associations by typing something like @… (you have to type three letters before we show the dropdown). When you do that, the Contact is automatically associated, as you can see below. New JibberJobber Widget: Your Calendar! 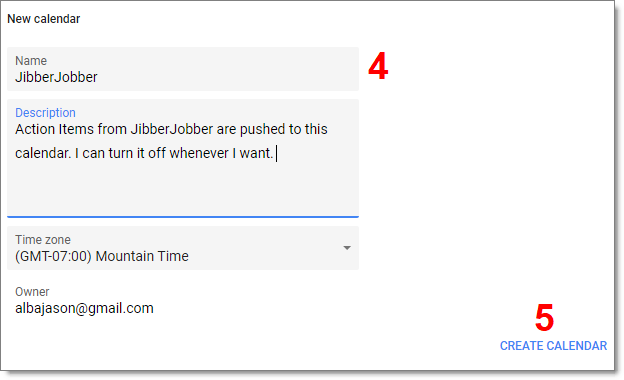 We recently announced the first (and second) versions of our first Chrome Browser Widget, which we call the JibberJobber Job Search Widget (info here, download from here). 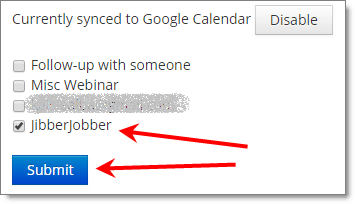 Now we get to announce our next browser widget, the JibberJobber Calendar Widget. This allows you to click on your browser toolbar and access your JibberJobber Calendar from anywhere. I have logged in (otherwise the Log Out button will be a different color, and prompt me to login). The default view is Monthly, which is my preference (on Google Maps my preference is weekly… weird, huh?). Under Option you can choose to show or hide things… such as birthdays, closed Action Items, etc. Poke around those preferences, but I just left them as default. Note the green Add Event button… we’ll get to that in a minute. 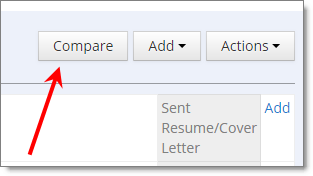 If I click the Add Event, or a plus icon next to a date, I can add a new Log Entry or Action Item. 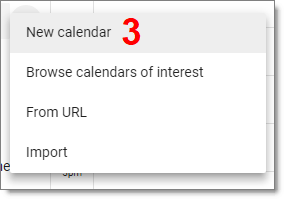 The green Add Event opens the entire add dialog, whereas the plus icon by a date opens up a small form that you can expand by clicking “edit” (just like in Google Calendar). Is this useful? When I was first presented the idea I thought “meh… kind of cool… not sure if we should spend out time on it.” But then I started playing around with it and honestly, this is a very convenient tool. 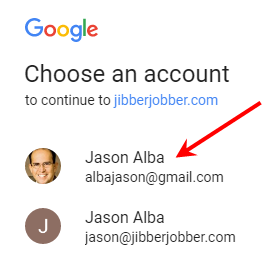 If you have ANY suggestions or enhancement requests, please send them my way (Jason@JibberJobber.com). I already have my list of six items… and can’t wait to hear from you. 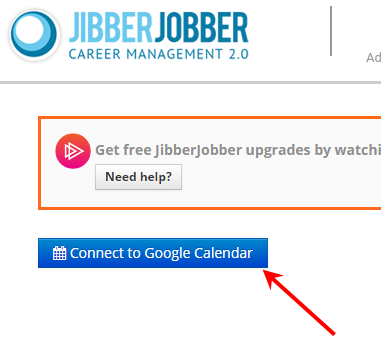 Comments Off on New JibberJobber Widget: Your Calendar!